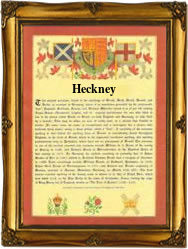 Recorded as Hackney and sometimes the rare dialectal Heckney, this is an English medieval surname. It is locational from the former village of Hackney, now the London borough of Hackney, a place first recorded in the year 1260 as Hakney. The meaning of the placename and hence the later surname is believed to be "Hacca's island" from the Olde English pre 7th century word "hacca" meaning a hook or bend, and "eg" an island. This was not necessary an island on a river, it could refer to a raised portion of land on a marsh or moor, but in this case it probably does refer to an island on the River Lea. Being locational this is usually a "from" name. That is to say a surname given to a person after he or sometimes she, had left their original homestead to move elsewhere. It was and it often remains, that the easiest way to identify a stranger was to call that person by the name of the place from whence they came. In this case the earliest recording is probably that of Benedict de Hackenaye, who appears in the Hundred Rolls of the city of London, in 1273. Later we have Adam de Hakenay in the Poll Tax rolls of Yorkshire in 1379, whilst in early surviving church registers that of William Heckney. He married Ann Buckler at St Brides Fleet Street, in the city of London, on September 27th 1618.